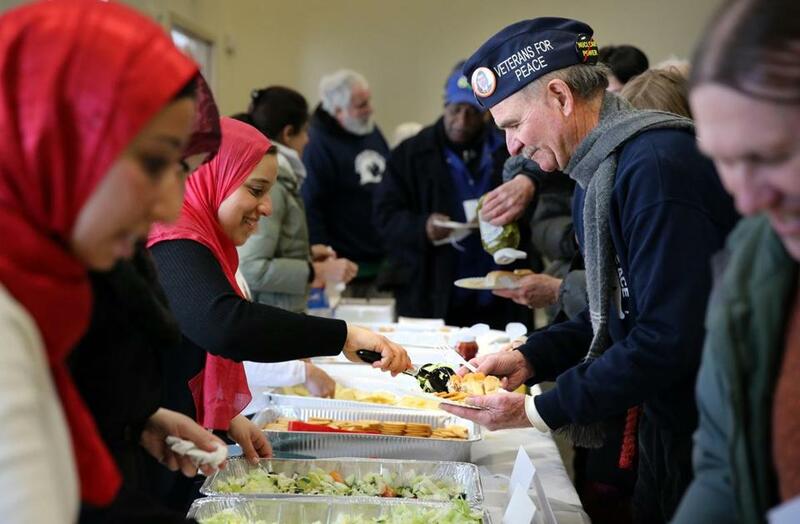 Gilane Shaker, left, of the Islamic Society of Boston Cultural Center served food to US Navy veteran David Bonner during a gathering in Boston on Saturday. Local antiwar military veterans gathered outside New England’s largest mosque Saturday to show support for Muslims amid growing anti-Muslim sentiments that some believe have been stoked by the inflammatory tone of the presidential race. The rally at the Islamic Society of Boston Cultural Center in Roxbury was organized by the Smedley D. Butler Brigade of Veterans for Peace and drew about 200 people. Members of the mosque said they were touched by the support. Speakers included leaders from veterans’ groups and Islamic organizations as well as Boston Police Commissioner William B. Evans, who was last to address the crowd. Evans also visited the mosque in December after a Muslim couple carried out a mass shooting in San Bernardino, Calif. He said Saturday that Boston police treasure their relationship with the Muslim community. Nationally, Veterans for Peace has launched a campaign called “Veterans Challenge Islamophobia” to combat anti-Muslim rhetoric. Dalia Sadek of the Islamic Society of Boston Cultural Center showed her support. Supporters of the movement have attended events for Republican presidential candidate Donald Trump in the early voting states of South Carolina and Nevada to denounce his remarks about Muslims, said Barry Ladendorf, president of Veterans for Peace’s national organization. He said the group does not take partisan political positions, but objects to comments Trump has made about closing some mosques, requiring Muslims to register in a national database, and keeping open the prison at Guantanamo Bay. Last week, Veterans for Peace issued a statement criticizing Trump and his GOP rivals Ted Cruz and Marco Rubio for using “pro-torture rhetoric” on the campaign trail. After Saturday’s rally, the crowd was treated to lunch inside the center, where some non-Muslim participants observed afternoon prayers. A representative of the mosque answered questions about the building and about Islam. Yusufi Vali, the center’s executive director, said he was moved by the sight of Muslims and veterans standing together. He said African-Americans, Mexican immigrants, Native Americans, and veterans have also experienced the same marginalization now facing Muslims. Mariam Mahmoud, 33, of Sharon, became emotional discussing the display of support. She said women who practice Islam are often targeted because the hijabs they wear to cover their heads identify them as Muslims to others. 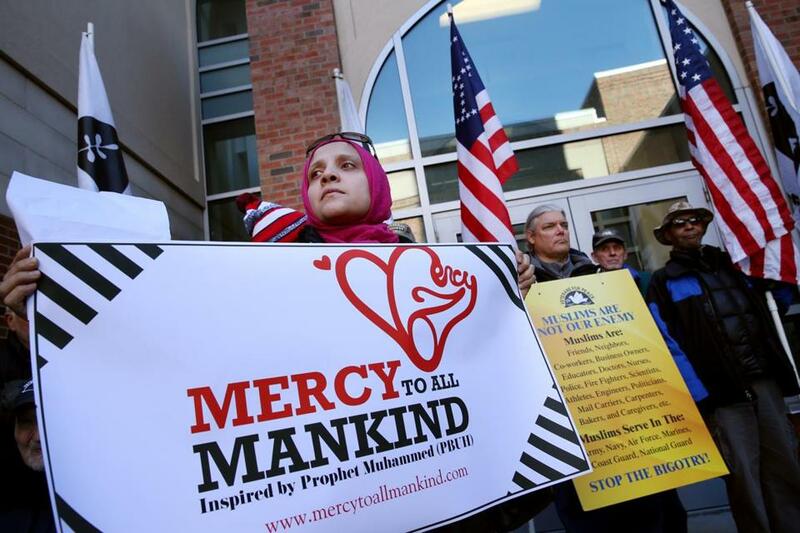 Mahmoud said she is cofounder of Mercy to All Mankind, a nonprofit Islamic outreach group. She said she was once singled out by a man who made an obscene gesture at her while she was at an intersection with her three children. “I didn’t even do anything,” Mahmoud said. Armida Commesse, 36, of Foxborough, said she appreciated the veterans’ willingness to learn about her religion.